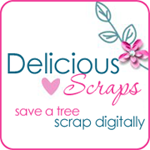 Delicious Scraps: Commercial Use - Bow and a SALE!!! Commercial Use - Bow and a SALE!!! Just wanted to let you know that my SALE has been extended to Sept 30th!! All my $3 kits are now $2 and you can get this GORJUSS HALLOWEEN KIT for just $1.50! Don't miss out!!! This one is made with art by Suzanne Woolcott - TOU obiding!! Click on the image to get it!! Lots of potential - THX for sharing!